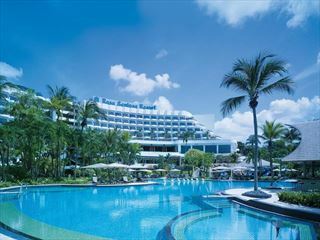 Found on the spirited resort island of Sentosa, just off the southern coast of Singapore, this colourful oasis is one of our favourites when we fancy a bit of fun in the sun. With cool mood-lighting, sophisticated décor, sensational views and a sparkling pool, this is the ideal spot for trendsetters and socialites. Surrounded by lush, emerald green gardens and nestled just along a sugary sand beach, this hotel is picturesque, and clearly prides itself on its natural beauty. Venture inside and you’ll find that the retreat has a stylish, ultra-contemporary feel to it, adding a cool touch to traditional Balinese décor. Many of the rooms and suites have sophisticated furnishings, with mood lighting adding a unique and fun twist. 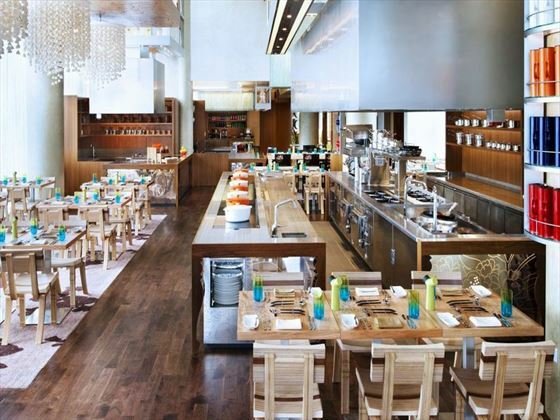 A trip to Singapore should never be without delicious, innovative food, and you won’t be left disappointed here. We always find ourselves craving another succulent steak at Skirt, whilst The Kitchen Table inspires us to try something new with its wide array of international flavours. After you’ve had your fill, venture along to the Away Spa for a soothing and revitalising treatment, or an indulgent dip in the herbal bath. 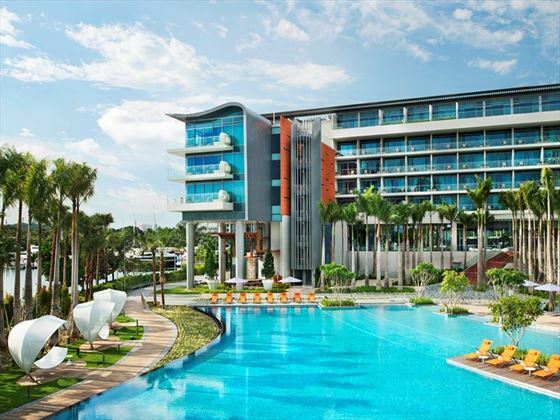 Nestled on the beautiful resort island of Sentosa, the vibrant décor and ambience at this retreat is clearly inspired by the fun island lifestyle Sentosa evokes. 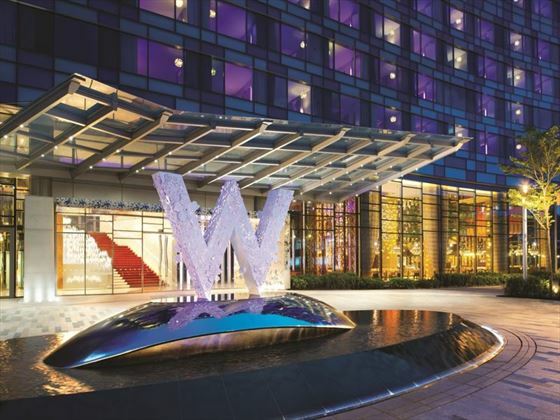 You’ll be close by to some of Singapore’s best attractions, including Universal Studios Singapore, the gorgeous Siloso Beach, and bustling Quayside Isle waterfront brimming with great shops and local restaurants. Wonderful Room – With a name like this, it’ll come as no surprise that these 40sqm rooms are delightful. 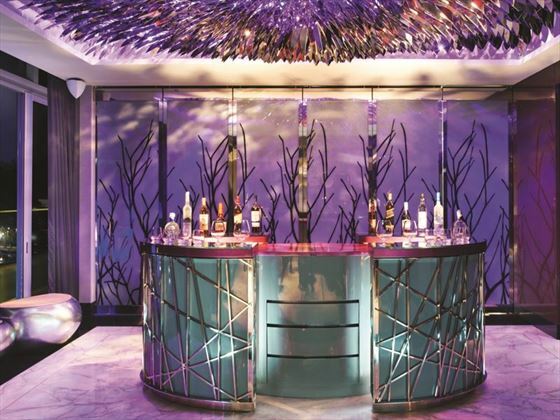 The décor is contemporary and cool, with purple mood lighting inspired by orchids providing a sleek style. Boasting island views. Sleeps a maximum of three guests. 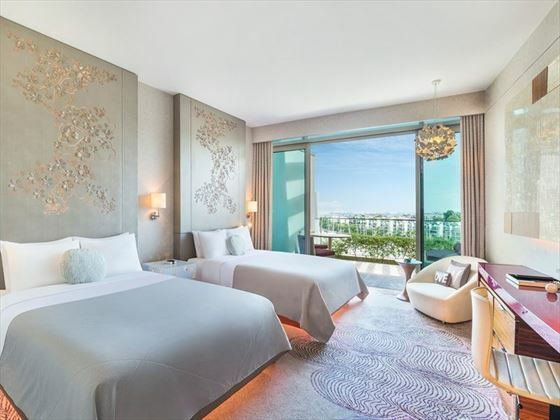 Fabulous Room – These spacious 40sqm rooms are gorgeous, featuring trendy décor and floor-to-ceiling glass doors that open out onto a private balcony and views of the pool. Sleeps a maximum of three guests. 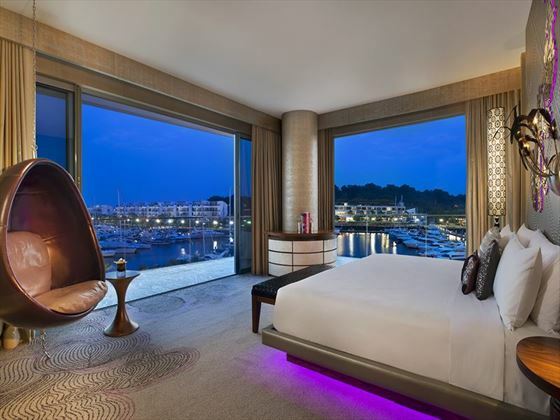 Spectacular Room – Modern 40sqm rooms with a cosy king-size bed, a small balcony overlooking the marina, and funky purple and flowery accents. Sleeps a maximum of three guests. Away Room – Colourful 41sqm rooms, nestled on the same floor as the Away Spa, and just steps away from the treatment rooms. Boasting a lovely terrace with a small plunge pool and daybed. Sleeps a maximum of two guests. Spectacular Away Room – Extensive 46sqm rooms with vibrant décor, featuring a private wooden deck adorned with a private plunge pool. Sleeps a maximum of two guests. Away Suite – Peaceful and elegant 82sqm suites, just steps away from the soothing Away Spa. These cool suites also boast one and a half bathrooms, a separate living space, and a terrace with a plunge pool. Sleeps a maximum of two guests. 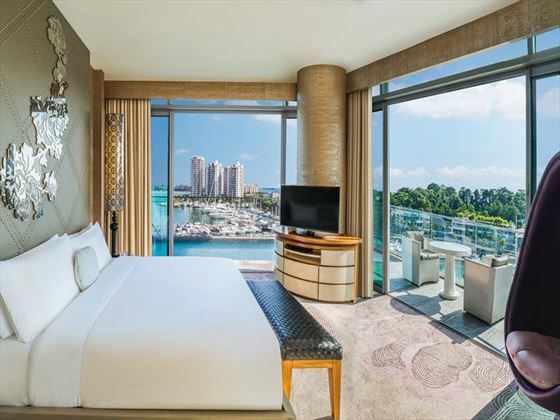 Marvelous Suite – These 84sqm suites truly are marvellous, offering a large balcony overlooking the marina, a wonderful marble bathroom, an expansive living area, and an Islander Polished stone bathtub. Sleeps a maximum of three guests. Fantastic Suite – Sleek and contemporary 75-76sqm suites with luxurious amenities, including a lovely living area with an open bar, a scenic balcony with a plunge pool, a bathroom with its own TV, and glitzy décor. Sleeps a maximum of three guests. 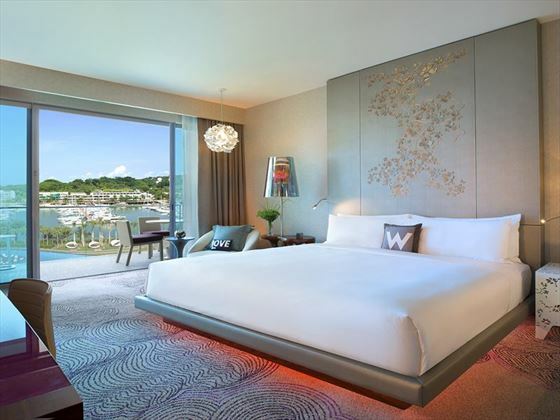 Wow Suite – Fabulously vibrant 96sqm suites, featuring custom-designed furnishings, abstract and artistic décor, a living area with an open bar, a bathroom with its own TV, and a balcony with a plunge pool. Sleeps a maximum of three guests. Extreme Wow Suite – Vivacious yet chic, this 195sqm suite is the ultimate luxury. 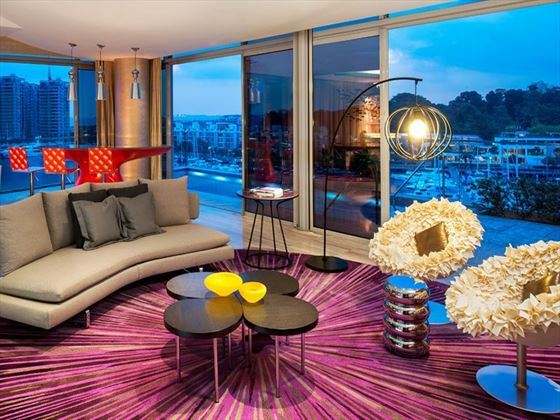 Quirky yet modern designs and purple mood lighting add a fashionable touch, with the suite boasting a separate living room and entertaining space, a dining room for six, a full kitchen, two bathrooms – one with a jacuzzi bathtub, a large balcony with a plunge pool, and stunning ocean views. Sleeps a maximum of three guests. 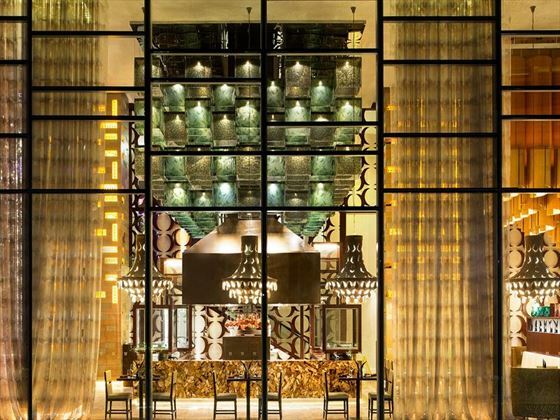 Skirt – The hotel’s signature restaurant prides itself as an innovative and fiery steakhouse, boasting only the most decadent cuts of meat cooked in the parilla grill and served alongside fresh-from-the-sea seafood. Opening times: 6pm-11.30pm (last order 9.30pm) Sunday – Thursday, 6pm-12pm (last order 10.30pm) Friday – Saturday. The Kitchen Table – A classy and inviting restaurant that will take you on a foodie journey around the world, including tantalising Western, Asian and Mediterranean favourites. Opening times: Breakfast – 6.30am-11am, Lunch – 12pm-3pm, Dinner – 6pm-10pm Sunday – Thursday, 6pm-10.30pm Friday – Saturday. WooBar – A sophisticated and cool lounge bar, perfect for mingling and enjoying a craft cocktail or two. Opening times: 11.30am-1am Sunday – Thursday, 9am-1am Friday – Saturday. Wet Bar – A truly stylish poolside bar, serving up a mix of flavourful snacks, healthy cuisine and innovative cocktails. You won’t even have to lift a finger – the Ambassadors will bring your drink to your lounger. Opening times: 9am-7pm Sunday – Thursday, 9am-10pm Friday – Saturday. In-room Dining – What could be more indulgent than breakfast or dinner in bed? The 24-hour dining menu features the best dishes from the resort’s divine restaurants and brings them straight to your door. 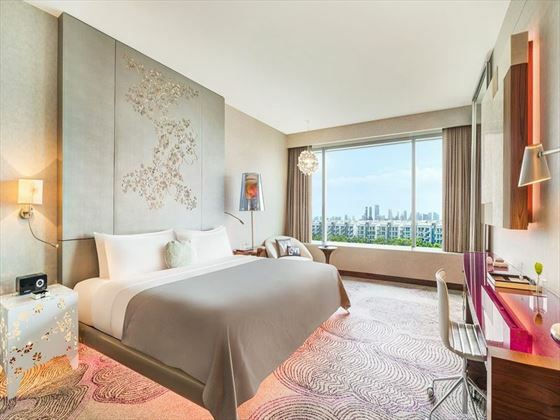 Set in luxuriant tropical gardens near the renowned Orchard Road shopping and business district, the Shangri-La Hotel is a leading luxury hotel in Singapore which offers discerning travellers legendary Shangri-La hospitality in a tranquil resort setting. 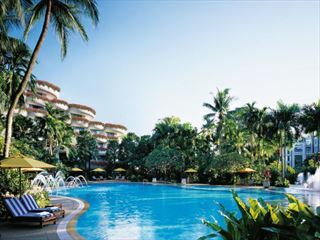 Set overlooking spectacular beach, sea and tropical garden scenery, Shangri-La's Rasa Sentosa is Singapore's only beachfront resort. With a wonderful selection of child-friendly and luxurious facilities, this is a great choice for family holidays and romantic couples' breaks in equal measure. 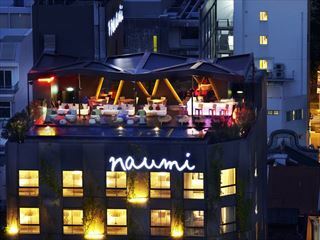 Discerning travellers will love the cool and collected vibe exuded by Naumi Hotel, Singapore. 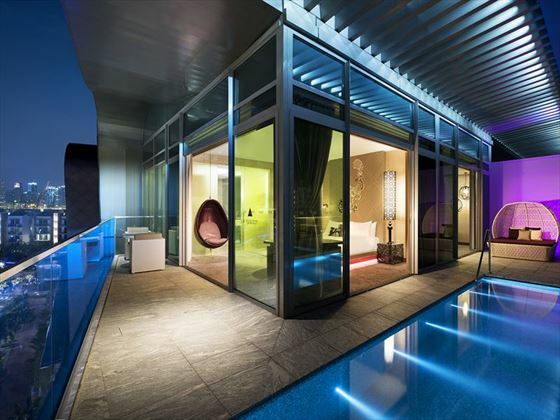 Located in the heart of the city centre and dubbed an 'unexpected oasis in the city', you'll be treated to stylish designer interiors, and a fabulous rooftop infinity pool and bar that boasts incredible panoramas.